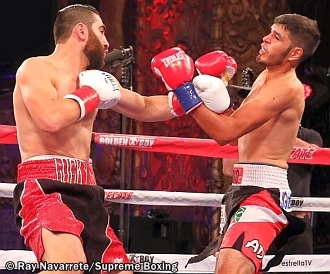 LOS ANGELES (Oct. 12, 2018): Rising super welterweight prospect Ferdinand Kerobyan (11-0, 6 KOs) of North Hollywood, California phenomenally stopped Rolando Mendivil (10-6, 3 KOs) of Sinaloa, Mexico in the first round of the scheduled eight-round main event of the Oct. 12 edition of LA FIGHT CLUB at the Belasco Theater in Los Angeles and televised nationally on EstrellaTV's Boxeo Estelar. "I felt great. I never like to say that a fight is easy. I just make it look easy," said Ferdinand Kerobyan. "I'm proud of my performance. I showed that I'm a warrior. I'm looking for bigger and better names. I want eight and ten round fights only." "I feel stronger than ever before," said Azat Hovhannisyan. "Whatever has happened in the past is past. I'm ready for a world title fight. I know I still have a lot left in the tank." "I prepared really well for this fight. I like that I worked by jab in this fight. I'm going to look at it when I get home, review it and look to fix any mistakes. We are going to work to get better and better, said Richard Acevedo." "I felt good and strong. There are a couple things to work on. He's a tough guy and his right hook to the body is really accurate. I'm ready for any upcoming dates to make my return to the ring, said Rudy Garcia." "I felt rusty. It was tough because he [Meyers] was throwing shots from strange angles. I think I'm ready for six-round fights. It's definitely fun to be coming back. I love boxing, said David Mijares. "THE OFFICIAL BEER OF BOXING" and Casa Mexico Tequila. The fights took place Friday, Oct. 12, 2018 at the Belasco Theater in Los Angeles.